Well hello there, April – how did you get here so fast?? What did you do with January and February and March? Or my 30s for that matter? It’s pretty random, I know, but I tell you this much – it suuuuuuure puts things in perspective taking that quick moment to freeze time! Because believe it or not, another 10 or 20 years will pass us by before we know it, and we’re gonna be praying HARD that our past selves set us up on the right path to catapult all our hopes and dreams and financial desires! Similar to that Retirement Freedom calculating we talked about the other week, the power of time and compounding is no joke. Just think about where you were yourself 10 years ago financially, and where you are now? Night and day, right? Anyways, enough philosophizing, but do pat yourselves on the back for caring enough about your future to be spending time on a personal finance blog right now :) I’m sure you don’t admit it to the entire world, but you’re in good company here and we salute you. THRIFT SAVINGS PLAN (TSP) (+$445.49): My favorite addition to our net worth family ever since my wife went back to the work force last Fall :) The #’s are so fun to watch compound on top of each other with every paycheck, and is the one area of a 9-5 I miss! 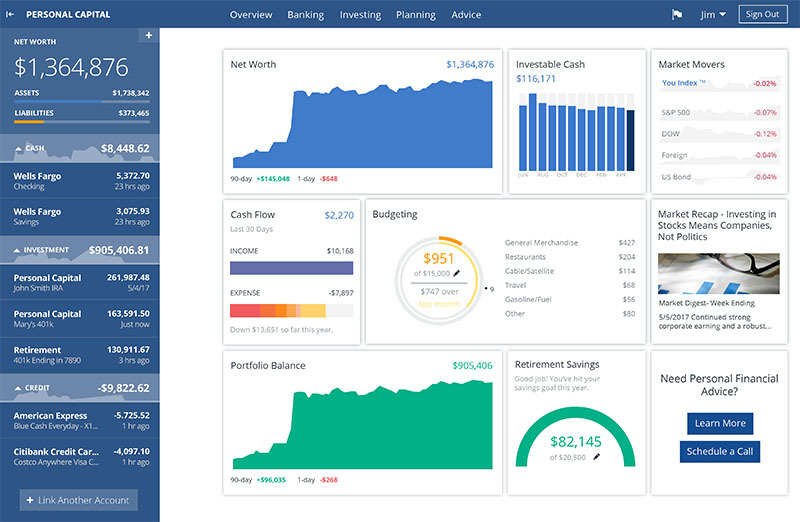 Having your company do all the payroll and taxes for you, and then giving you FREE MONEY just for doing what you’re supposed to be doing anyways – saving for retirement! Easiest way to double your money. Make sure you’re taking advantage of it if your employer offers contribution matches! ROTH IRAs (+$94.68): Nothing special going on here, although next month it’ll look a lot better as we max this out for the 2016 year (only 12 more days left, FYI!). I always wait until our taxes are done for the year before doing so, just to make sure we have the cash and there aren’t any surprises. CAR LOAN: (-$464.10): Still enjoying our pumped up cash reserves too much to get myself to pay this off in one fell swoop, but I have been throwing in an extra couple of hundred towards our monthly bills each month. I’ll probably make the call to kill it once and for all by the end of the year, unless something funky happens. I don’t hate debt as much as other people, so long as you can afford it (wait, did that make sense? haha…). And that’s March for ya! That’s it for today! How did your month go? In the positives now from the negatives? In the negatives from the positives? Share below so we can all pat you on the backs or console you :) It’s a 100% safe zone here where we actually encourage people to talk about their money openly! Imagine if the real world allowed that? To see all our net worth reports over the years, click here, and to see our blogger net worth tracker (now over 240) click . Below you’ll also find resources to help you get started in tracking your own if you haven’t done so already. One of the best things you can do for your money, I promise!! UPDATE: I initially calculated the #’s wrong here, so if you saw this post in email or online/social channels Monday morning, that’s why things look differently now. I WISH it were up $20,000 this month, haha, but sadly that is not the case :) Thanks to all those in the comments section who alerted me to the discrepancy which has now been fixed. Sorry! Outstanding month! You made more in one month off your investments than a minimum wage worker makes all year. How’s that for perspective? We are fully funded for both IRA’s for 2017 and I will make the last investment into 2017 HSA this budget period. Dividends are flowing in and being dripped until they reach $1,000 p/month, at which time they will be allowed to accumulate in cash and be added to new monies to be invested in value opportunities along with rental proceeds, etc. The plan has pretty much reached the boring stage which is a good place to be, I suppose. How did you get those returns in the vanguard accounts when the market was barely up in March? I thought you were indexing. AHHH I figured it out!! My deposits from maxing out my SEP and ROTH Ira on the 31st hit the account that SAME day (?? ), and I didn’t catch it since my savings accounts weren’t dinged that money… So alas I was *NOT* Up $18,000 this month, and instead closer to $800 – hah. Big thanks to you, and everyone else, who mentioned something looked off… It’s now all been corrected to show the right amounts for March. (The new IRA #’s and cash hits will be reflected in next month’s updates so it’ll make much more sense). Wow J. You’re cruising along now. Isn’t compounding interest amazing? Nice to have money babies out multiplying for you. March saw bi-annual car insurance payment and a dentist bill. This is why I save money from each paycheck, to cover known (car) & unknown (dentist) bills. In March, I was up $17k to barely get over $320k. I also realized my job is not as fun as it used to be. So, this is all the more important. yeah it is… more $$ = more freedom. Great preamble! Isn’t the passage of time the strangest thing. It gets even crazier when you have kids. It often feels like the fast forward button on life got pushed after we had kids. Anyhow, another great net worth update. It’s super inspiring to see these each month. Keep them coming! Yeah, fast AND slow actually. My kids still feel like babies to me, but on the flip side I can’t even remember what my life was like before them? Seems like a whole world ago! I have a Toyota Camry and have been getting letters and emails from my local dealerships effectively asking me to sell them my car. Since many Lexus are Toyota engines in a very pretty vehicle, they are probably feeling the same upsurge. That SEP IRA of yours is getting pretty out of control! Awesome work! I’m totally like you: At the end of every month when I get paid and my 401k contributions are made, I secretly hope the market tanks. That way I can scoop more shares on the cheap before it zags back upward. I was up $2500 in March which is pretty much just my own contributions (& match) to my savings, 401K, & Roth. I had a couple of extra bills including brakes & maintenance for my car which offset market gains. What’s funny is that before I took it in, I looked at my car budget and figured out I had $379 available before I would have to dip into my emergency fund so that’s the number I went in with in my head. The bill came to $374.50 so my emergency fund is intact. :) Kinda weird how that worked out. our cars went up like crazy this month, more than they did last month. I was talking to my neighbor about this and he said maybe to do with used cars being on short supply. Interesting to see it with other cars too… could be it? Great month J! I’m amazed at the swing in prices on used cars. They seems to be all over the place. I wonder if the availability of a particular model of used cars in the market drives their fluctuating prices. Crunching my March numbers tonight. This month I have a $7k tax bill due…. AND now I have to find a new accountant… I pay this guy to make sure this stuff doesn’t happen, and he obviously calculated extremely wrong. At this point I could do it myself and do a better job. He just wasn’t paying attention. There are all sorts of payroll services that also do all your quarterly paperwork for like 20-30 month. I could just do that and then figure out turbo tax for s-corps. I’m sure on a per hour basis I would lose money for the first year or 2 but after that it would be relatively easy. We’re still getting out of debt, so we’re LESS in the red this month than we were last month, and that’s always a great feeling. :) It’s so neat seeing our net worth creep upwards each month. It’s all worth it, slowly but surely. March was a great month financially, mainly because it was a 3 paycheck month. I was able to max out my 401k in record fashion by doing so on 3/31. You’re going to be a millionaire in no time! Nice!! I remember those 3 paycheck months – were so cool!! I only have 1 paycheck months s I wait until the end of every month to then pay myself in one main chunk to keep things easier… I hate business accounting, oddly enough? It’s amazing how your cars increased in value… rarely do I hear something like that. Unless it’s a “classic” of course. LOVE Leo in The Great Gatsby!!!!!! Cars appreciating…who woulda thought? Great month, once again, J! Time certainly doesn’t seem to slow down as you get older, does it? What’s the saying? You overestimate what you can accomplish in a year and underestimate what you can accomplish in a decade. I funded our 2017 IRAs a couple weeks ago – when the market went down. I thought about waiting it out to see if the market would totally tank, but it’s a mental thing for me…I really needed to get that money out of the checking account and inaccessible. So we had a nice bump in the NW, mostly due to contributions and a nice tax return. Another big boost this month! I am with you and hoping for a bit of a correction here to make some purchases in our Roth IRAs. Obviously not going to make a huge difference but I like the mental victory. Getting ready to pull out numbers today! I made a boo boo calculating this today! It’s all been updated now, but basically my deposits from maxing out my SEP and ROTH Ira on the 31st hit the account that SAME day (?? ), and I didn’t catch it since my savings accounts weren’t dinged that money. So alas I was *NOT* Up $18,000 this month, and instead closer to $800 – hah. Your Vanguard account is awesome. Congrats! Our rate of return at Vanguard is just 5%. :( I think that’s because we moved our investments there in 2014. There was more volatility back then. The TSP is really great too. That’s the way to build wealth. It’s so easy to just put on autopilot and reap the benefit in 20-30 years. 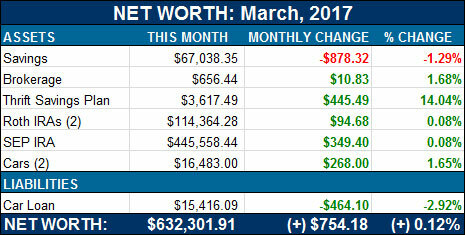 Wow, nice net worth increase for one month! I enjoy these posts so much! I really should start tracking our net worth more precisely. But honestly, it’s going to take such a nose dive this fall, I figure maybe I’ll hold off until I’m collecting a paycheck again ;) How’s THAT for twisting my numbers?! Say whaaa….your car value increased!?! How does that work? I don’t even bother to calculate the value of our cars in our net worth. I always assume they’re basically worthless. Afterall, they don’t generate any cash, and they’ll never be worth more than what I paid for them….anything I do happen to get when I sell is just a bonus. I hold on to cars a very long time, so this is usually pretty true. No shame in that… Do you keep your house in the net worth reports? Seems there are those of us who keep houses and cars in it, and then those who leave them both out for similar reasons. The car one I get more, but leaving out the house portion always surprises me… mainly cuz it’s such a huge part of your financial picture! Pumped for your April post honestly – to see some massive investment account pops! Solid month, nothing too extreme, and the thrift is always awesome to see the growth. In the first quarter, my net worth has jumped a solid 7% YTD or approximately $20K, so not doing too bad, but know that there could be improvements. For me, though, a lot of the fluctuation within the NW is due to the stock market, and being a dividend investor – I actually wish there were some “nice” corrections to scoop up some undervalued blue chips, haha. However – I am contemplating throwing more at the ugly as hell auto loan that I still have (Around $6.1K now), as I can open up new cash flow fairly quick if I pay that off. Hmm.. may have that paid off easily by the end of the year instead of the next 20 or so months. Appreciate the share J – talk soon. Nice work on your side too, sir! I think we’ll all have a chance to scoop up deals once the markets crash :) Can’t keep going up forever! dam man, thats quite the portfolio. No house in your net worth? For a brief moment, I was thinking you did the unimaginable, bought a lottery ticket and won $25K from a scratchoff, netting about $18K. Or landed a bookdeal, and this was your upfront money. It started when your email came out, and I was at work. (For anyone that’s heard me call myself retired, I still do. I spend 2 days at a high school, tutoring kids in math. I was never so happy to get up at 5 in the morning to go to any job). So there I was, thinking about Trigonometry, Algebra, some Pre-calc, and what in the world J had done to score $19K in a month where the market was essentially flat. And then, I caught a Tweet, it was all a typo, a miscalculation. My favorite student walked in, and saw the look on my face. She actually asked me if I was ok. I kept the story short, but explained the great news that wasn’t. She was a little sad for you, too. “It must be like thinking you had a lottery ticket that was good for $20K but then discovered you read the numbers wrong.” Yup. It was all worth it just to see a nice note from you this morning :) A guy’s gotta mess up every now and then to appreciate the times he doesn’t, right? I’m also thinking of simplifying my increasingly complicated net worth tracking, but I guess the scenario here in my country (Mabuhay from the Philippines!) is also a factor why I need to spread out my assets (banks may close, the equivalent IRAs are not very enticing, etc.). Can relate with reviewing your net worth for the past years! I am also trying to do that while I prepare for an opportunity to present my journey as part of a Financial Wellness Program in a company. Wish me luck and God speed for you too! As for my diversifying stuff, yeah – def. something I need to work on for sure, haha… I’m rather addicted to retirement accounts because of all the benefits (and the FIRE crew only adds to it with all their hacks on how to convert them before you’re in your 60s! ), but I do need to be better about spreading the $$ around. I used to do it with money I had leftover after maxing out my SEP and Roth, however ever since kids I rarely have anything left over and so my investing typically stops there. Outside of the incremental Acorns deposits (which was why I first signed up to them). Anyways, all that to say that yes – it’s def. smart to have your hands in a handful of pies, and at some time in the near future I hope to be back to doing that as well… Always something for us to be working on, eh? Next post: Awesome Savings Account for Emergency Funds!